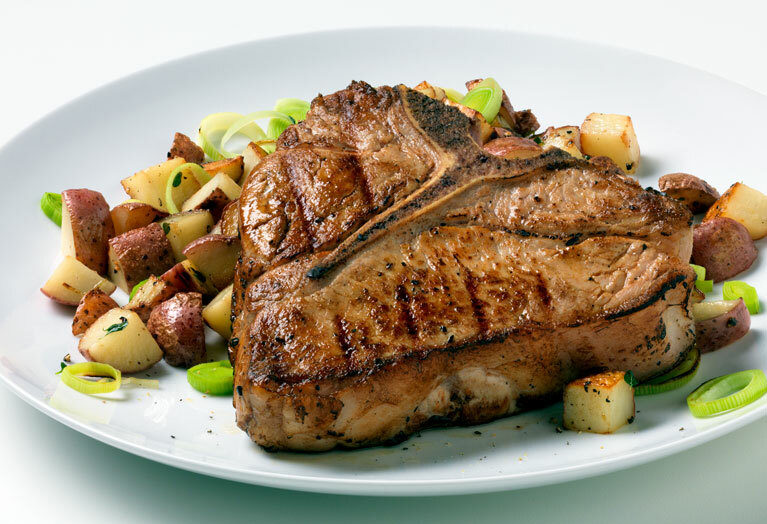 You can't every go wrong with a classic meat-and-potatoes dish, and we suggest you choose veal as your protein and prepare a double batch of Grilled Veal Chops with Potato Leek Hash to dig in to all week long. It only takes 30 minutes to prep and is on the table, start to finish, in under an hour! Heat 1 tablespoon oil in large nonstick skillet over medium heat until hot. Stir in potatoes, leeks, 1 tablespoon thyme and 1/2 teaspoon garlic salt. Cover and cook 12 to 16 minutes or until potatoes and leeks are tender and begin to brown, stirring occasionally. Remove cover and continue to cook 3 to 5 minutes or until potatoes begin to crisp, stirring occasionally and adding remaining 1 tablespoon oil to prevent sticking, if needed. Meanwhile, combine remaining 1 teaspoon thyme, 1/2 teaspoon garlic salt and pepper; press evenly onto veal chops. Place chops on grid over medium, ash-covered coals. Grill, uncovered, 15 to 17 minutes to medium (160ºF) doneness, turning occasionally. Serve chops with potato mixture. 70 mg cholesterol; 4 g monounsaturated fat; 3 g fiber; 15.1 mg niacin; 0.5 mg Vitamin B6; 1.4 mcg Vitamin B12; 3.5 mg iron, 12.8 mcg selenium; 3.5 mg zinc; 116.2 mg choline. 153 mg cholesterol; 4 g monounsaturated fat; 3 g fiber; 14.9 mg niacin; 0.5 mg Vitamin B6; 1.6 mcg Vitamin B12; 4.1 mg iron; 16.0 mcg selenium; 6.4 mg zinc; 146.3 mg choline.